oh...the things I do for this blog....yet again I take one for the team, so that you, the consumer, can save your hard earned cash....ok, you got me, I would have done this even without the blog. So, what am I complaining about? the freshly re-branded Organic So Delicious from Turtle Mountain, formerly known as Organic Soy Delicious. That's right, I bought a non-dairy frozen dessert...and I want my $4 back. I've been waiting a long time for it to go on sale and it finally did yesterday. Now I wish it hadn't. Ok, ok, I'll be nicer now. I mean, if you have problems with dairy, then you probably never had real ice cream and you don't know what you are missing. 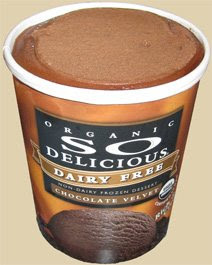 There's even the added incentive that this particular brand is very low in fat (and vegan and cholesterol free)....the problem is ingredient #3: "ORGANIC BROWN RICE SYRUP AND/OR ORGANIC TAPIOCA SYRUP" You can taste it, and as much I love a good tapioca pudding, I don't want it in my frozen dessert. I didn't even make myself that big a serving, but I started dumping toppings on it trying to cover the taste....wait, that give's me an idea: I think we've having so delicious milkshakes with dinner. It just might work! On Second Scoop: ...well, the shake idea didn't work, and I tried REALLY hard to make it work. I added whip cream, milk, cocoa (was out of Nesquik), and then in one final blaze of glory, I blended in 3 Oreos. It wasn't awful, but it was by no means a real milkshake. I think I'm all done with So Delicious.